An event of great significance occurred within the sphere of minority community politics in Sri Lanka on June 3rd 2015. Three political parties representing sections of the Tamil people living outside the Tamil dominated Northern province and Tamil majority Eastern Province announced at a media conference held at the Taj Samudra Hotel in Colombo that they had forged a new configuration called the Tamil Progressive Alliance(TPA).The new alliance comprises the Democratic Peoples Front (DPF)National Union of Workers(NUW) and Up Country Peoples Front(UCPF)led by Mano Ganesan, Palany Thigambaram and Velusamy Radhakrishnan respectively. The TPA’s name in Tamil is “Tamil Mutpoakku Kootani”. DPF leader Manoharan Ganesan known popularly as Mano Ganesan will function as the leader of the TPA.Palany Thigambaram of NUW and Velusamy Radhakrishnan of UCPF will be the joint deputy leaders of the new alliance.A.Lawrence , the UPFA Secretary has been appointed as the General Secretary of the TPA. A special advisory committee will be set up to aid the new alliance. A memorandum of understanding was also signed by the Ganesan-Thigambaram – Radhakrishnan triumvirate. 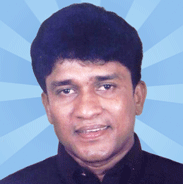 Mano Ganesan has earlier been a Provincial councillor, Parliamentarian and Municipal councillor. Currently he holds no elected post. Though he was earlier elected to Parliament from Colombo district , Mano Ganesan contested in Kandy district in the 2010 polls and lost.Palany Digambaram who was elected from Nuwara – Eliya district in 2010 is the cabinet minister of Plantation Infrastructure Development in the Sirisena-Wickremesinghe Government. Velusamy Radhakrishnan who was also elected from Nuwara Eliya district in 2010 is currently the state minister of Education. TPA leader Mano Ganesan elaborated further on the aims and objectives of the new alliance in an interview with Chathushika Wijeyesinghe for the “Daily Mirror” of June 10th.In that interview Ganesan said – “Geographically we are representing the Tamil people who are residing outside the Northern and Eastern Provinces. The Tamil population in the country as per the 2011 census is 3.2 million. Nearly 50% out of this population, that is about 1.5 million, live outside the Northern and Eastern Provinces, namely the Central, Western, Sabaragamuwa, Uva , Southern and North-western provinces. They live mainly in the Districts of Nuwara-Eliya, Kandy, Matale, Colombo, Kalutara, Gampaha, Ratnapura, Kegalle, Badulla, Monaragala, Galle and Puttalam. We are representing these people”. Explaining further about the demographics Ganesan said “We have three segments of Tamils living in these areas. First is the Up-Country Tamils who live in the central region, second is Tamils who have migrated from the Northern Eastern Provinces and settled in the Western Province and thirdly Tamils who are neither of upcountry origin nor North Eastern origin, but born and bred in Colombo who are mostly Indian in origin, primarily speaking Tamil, a little Malayalam and Telugu and following the Hindu, Christian and Islam faiths. Our Alliance represents all three segments”. Asked as to why an alliance with the Tamil National Alliance (TNA)was not entered into Ganesan replied –“ That will be an all-island Tamil alliance. We have no immediate necessity to form an all-Island Tamil Alliance. To my knowledge the TNA is also not interested, because the ground conditions of the north and south are different. We are mostly living in a cosmopolitan atmosphere as minorities, with the Sinhalese in the South. We are just out of a bloody racist war. We can’t do anything that will be misunderstood by the Sinhala community or we can’t allow the racists here to use our emergence as a tool for their political survival. Besides our destiny is equally linked to the Sinhalese as it is linked to the Tamils of the North”. Speaking further Mano Ganesan emphasised that the Sri Lankan polity as well as “ the international community (IC) considered that the Tamil problem in this country centred only in the Northern Province. Therefore they consider the TNA as representing all the Tamils in Sri Lanka. Both these stances are wrong. The Tamils living outside the Northern and Eastern Provinces are technically ignored. We primarily represent them. I wanted to bring these facts to the attention of the Srilankan communities and the international community. Tamils in the South should receive national and international attention. …….We have not obtained reasonable attention in the nation after delivering nearly 650,000 Tamil votes in the seven provinces outside the North and East at the last presidential election. …….We too are part of this undivided Sri Lanka. Hence, we demand attention. As political parties, we were performing separately. Now we have come together establishing a powerful leadership. It is the TPA. …….. What I demand is that we too need focus and attention. Do not ignore us. It is the message”. An interesting aspect about the new political configuration is that the largest political formation of Up Country or Plantation Tamils, the Ceylon Workers Congress (CWC) has been left out of this alliance. In a sense the new alliance is a union of three smaller anti- CWC organizations. Past experience has demonstrated that alliances formed by smaller entities with the CWC in the interests of greater Tamil unity ends with the CWC deriving political benefits at the expense of the other non – CWC parties. A recent example was seen in the last elections to the Sabaragamuwa provincial council.Parties such as the DPF and UCPF came together with the CWC and formed a loose alliance to ensure adequate representation for the Tamils in Ratnapura and Kegalle districts. They contested under the CWC symbol of cockerel.Two members were elected from the two districts. One was from the DPF and the other from CWC. However the DPF nominee subsequently joined the CWC. The CWC leader Arumugam Thondaman was accused of an arrogantly dictatorial conduct by the non – CWC parties. The Sabaragamuwa polls alliance soon collapsed.Later when elections were held to the Central and Uva provincial councils the CWC and non – CWC parties like the NUW and UCPF were at loggerheads though being constituents of the same United Peoples Freedom Alliance(UPFA).It is against this backdrop that the CWC is now being kept out of the newly formed TPA. It could be seen therefore that the new alliance is departing from this prevailing practice by calling itself as the “Thamizh Mutpoakku Munnani”or Tamil progressive alliance. Though the three constituents of the TPA call themselves the DPF, UCPF and NUW they have formed their new alliance under an ethnic description namely Tamil. Though the alliance calls itself “progressive” this move could be viewed as being regressive from a certain perspective. The idea seems to be that of garnering maximum votes by ethnic oriented mobilisation. The formation of the TPA also evokes memories of a broad based unity attempt engineered by the “Plantation Patriarch” Saumiyamoorthy Thondaman the grandfather of present CWC chief Arumugan Thondaman 16 years ago.The CWC under Saumiyamoorthy Thondaman in 1999 formed a a new configuration called the Inthiya Vamsavali Makkal Paerani (Indian Origin People’s Front) along with 19 fraternal organisations. The new front contested the 1999 Provincial council elections under the peacock symbol.Twelve persons of Indian Tamil origin were elected to the Uva, Sabaragamuwa and Central Province Councils, which had a total membership of 136. The formation of the Inthiya Vamsavali Makkal Perani was in a sense a historical regression. Inspired by the Indian National Congress, people of Indian origin in colonial Ceylon formed the Ceylon Indian Congress (CIC), in the presence of Jawaharlal Nehru on July 25, 1939. Its office-bearers had little connection with the plantation workers and represented Indian commercial interests. The rise of Thondaman within the CIC ranks saw the Indian Tamil plantation workers being drawn into the CIC. With the dawn of Independence, the CIC, representing plantation workers’ interests, contested the elections and won seven seats. In 1950 the CIC renamed itself the Ceylon Workers’ Congress. This was to counter the charge that the estate workers regarded India and not Ceylon as their homeland. It also reflected the desire of most Tamil families to seek permanent domicile in Sri Lanka. With Indian Tamils being deprived of their voting rights, the electoral fortunes of the CIC declined. By the 1960s, the CWC replaced the CIC completely. In the 1970s, the CWC began to play a strident electoral role under the auspices of its political wing. Thus all organisations representing plantation Tamils forsook any overt mention of an Indian connection and emphasised their Sri Lankan credentials. Under Thondaman, these organisations once again came under the “Indian” banner in 1999. The bold gamble was undertaken by S. Thondaman in order to increase voter support in the Provincial elections. Thonda relied mainly on the emphasis and assertion of the Indian identity to mobilise support in the elections. Saumiyamoorthy Thondaman and other Tamil leaders, including those of the leftist trade unions, chose the option of displaying an Indian identity in an act of political brinkmanship. One compelling factor behind this desperate move was the decline in trade union membership. A new mode of ensuring communal solidarity became essential. Also, most trade unions have in the past thrived on a diet of CWC bashing. For all of them to merge, a common meeting point was necessary. This resulted in a flagrantly “communal” campaign asserting the Indian identity. Although this strategy paid some dividends for the CWC in 1999 , it backfired on all the other Tamil organisations. Except for Mano Ganeshan who won in Colombo, no other non-CWC Tamil of the “peacock front” (the election symbol used by the umbrella organisation) was elected. The “giant” CWC gained at the expense of the other “pygmy” organisations. In spite of the combined campaign, the overall vote of the Indian Tamil parties fell. One consequence of harping on the Indian identity was that most Sri Lankan Tamils in upcountry areas refrained from voting for the Perani. In the case of the new TPA the constituent parties seek to mobilise as much votes as possible on the basis of ethnicity. The idea is to garner votes of all “shades” of Tamils living outside the northern and eastern provinces thereby ensuring and enhancing adequate political representation.Many Tamils of Indian origin who are now citizens identify themselves Sri Lankan Tamils and not Indian Tamils. With the differences between citizens by descent and citizens by registration diminishing after the 1978 Constitution, a broader Tamil identity is now evolving. Also the younger generation of Up Country youths are deserting the plantations and seeking employment in urban areas. The new front has taken these factors into consideration in naming itself as the Tamil progressive alliance. According to the 2011/12 Census there are 3,113, 247 Tamils living in Sri Lanka.Of these 1,611,036 Tamils are living in the Northern and Eastern provinces. Another 1,502,211 Tamils live outside the Northern and Eastern provinces.A sad fact is that the Tamils living in the seven Sinhala majority provinces have been deprived of equitable political representation over the years. Ironically whenever demands or proposals are put forward to devolve more powers so that the Tamil people of the Northern and Eastern Provinces could have a greater role in administering their areas of historic habitation, one of the standard responses is to point out that almost half of the Tamil population lives outside those two provinces. It is also pointed out ad nauseam that there is no necessity for a separate State or devolutionary unit in the North and East when so many Tamils are living in peace, prosperity and harmony with their Sinhala brothers and sisters in provinces outside the North-east. The crucial question however is whether these Tamils living outside the Northern and Eastern provinces enjoy political representation in Parliament and Provincial councils corresponding to their numerical strength in the seven “southern” provinces. It is also an incontrovertible fact that the greater part of Tamils of recent Indian origin described generally as Up Country Tamils or Plantation Tamils or Hill Country Tamils reside in the seven Sinhala majority provinces.Yet they are woefully ill-represented in Parliament. Moreover there is a visible trend of declining parliamentary representation too.This is best demonstrated by a brief examination of the 2010 Parliamentary election results. Ten Tamil MP’s from the CWC,UCPF and DPF along with three Tamils from the UNP, UPFA and JVP took their seats in Parliament in 2004. There was also the Muslim MP from CWC making up a grand total of fourteen.Compared to that figure in 2004 , the 2010 Parliamentary election results were disappointing. The number of Tamil MP’s elected or appointed from outside the North and East decreased from fourteen to nine. 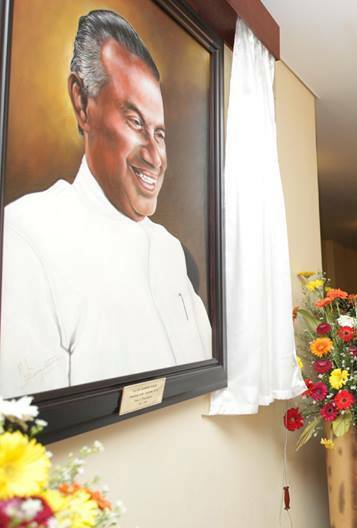 These included four from the CWC (three elected in Nuwara-Eliya and one appointed on the national list) three elected on the UNF list (two in Nuwara – Eliya and one in Colombo) and two appointed from Colombo on the UNP national list.However UNP stalwart Velayutham filled the vacancy caused by Badulla district MP Harin Fernando quitting Parliament to become Uva Province chief minister. Thus the total of Tamil MP’s from outside the North and East stands at ten currently. The CWC that had eight seats in 2004 had its tally halved in 2010. In 2004 the CWC contested with the UNP and in 2010 with the UPFA.Three were elected from the Nuwara – Eliya district. They were CWC leader Arumugam Thondaman ,Velusamy Rathakrishnan and Perumal Rajadurai. CWC’s Muthu Sivalingam became national list MP. Apart from the four CWC Parliamentarians all the other Tamil MP’s elected were from the UNF/UNP. In Nuwara-Eliya two other Tamils were elected from the United National Front. They were Pazhani Thigambaram and Jeyaratnam Sri Renga. Though elected from Nuwara –Eliya , Renga is of Jaffna origin. Seven MP’s in all were elected from Nuwara-Eliya .Five of them were Tamils. In 2004 only four from the district were Tamils.This “rise” in Nuwara-Eliya was not reflected in other districts. Badulla district with 116,000 estimated Tamil voters had returned two MP’s from the CWC in 2004. In 2010 there were none.Kandy district with 85,000 Tamil voters also did not return a Tamil MP despite the strenuous efforts of Mano Ganesan. Other districts like Matale, Kegalle and Ratnapura also did not return a single Tamil MP. In Colombo The DPF provincial councillor from the Western Province Praba Ganesan got elected as MP .Two other MP’s were appointed from Colombo as national list MP’s by the UNP.One was the UNP treasurer and long-standing Party member DM Swaminathan. This respected lawyer is a scion of the Sir Ponnambalam Ramanathan-Arunachalam family and was made MP to represent Colombo Tamils of Sri Lankan origin. He is now a cabinet minister.The other UNP national list Tamil MP was Ramiah Yogarajan. Yogarajan had quit the CWC and joined the UNP. He was appointed by the party as MP to represent the Colombo Tamils of Indian origin. The visible decline in Tamil representation outside the North and East has been a crucial concern for the Tamil political parties. It appears that voter apathy on the one hand and fragmentation of votes on the other are contributory factors of great magnitude in reducing Tamil representation.If one was to take Nuwara – Eliya the number of Tamil voters were estimated at 255,000. But when the preference votes gained by Tamil candidates on the UPFA and UNF lists were calculated it appeared that only around 100,000 plus Tamils voted in the district in 2010. Likewise 116,000 Tamil voters were estimated to be in Badulla district in 2010. Yet calculations based on the preference votes received by Tamil candidates indicated that only around 60 -65,000 Tamils voted in Badulla district. This seems to have been the case in Colombo district too in 2010. When the preference votes obtained by Tamil candidates and parties/groups were calculated the pattern did not indicate a high turn out by Tamils.This was further illustrated by the comparatively lesser turn out in electoral divisions with large concentrations of Tamils. Tamils of Sri Lankan origin in Colombo were more to blame in this respect. Another problem in 2010 was the high aggregate of spoiled votes in the Up- Country districts. The number of rejected votes in the districts of Nuwara – Eliya, Kandy, Matale, Badulla, Kegalle and Ratnapura were 37,236 (12.27%), 58,333 (9.45%)19,310(8.98%),24,169 (6.41%), 25,965(6.68%) and 37,022 (7.71% ) respectively. Preliminary surveys indicated that a substantial number of these rejected votes were in polling stations in Tamil areas. One reason for the votes getting spoiled was that voters had simply voted for numbers belonging to other parties or groups instead of the party for which they had cast their votes. Another reason for reduced representation was proliferation of candidates and fragmentation. Individual candidates received preference votes that were not enough to ensure their election.These votes helped enhance the number of MP’s to be elected from the party but did not help certain individual candidates to win. Thus these votes gained by some candidates helped others to reap the benefits. 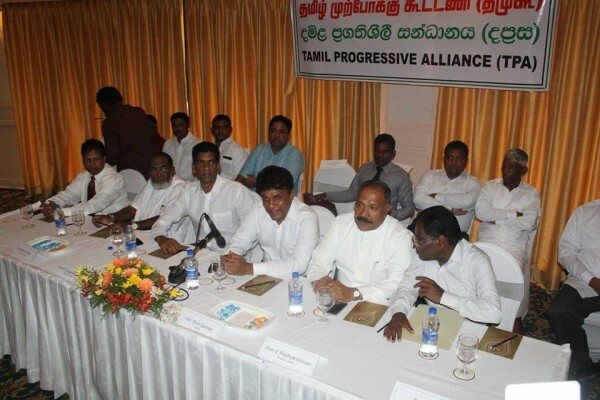 The birth of the Tamil Progressive Alliance has been timed for the forthcoming Parliamentary elections. The fundamental objective is to gain more Parliamentary representation for the Tamils living outside the North – East.The envisaged changes in the electoral system have caused much concern to the Tamil and Muslim communities who feel that their Parliamentary representation may be reduced.Two measures proposed to enhance minority party representation is the setting up of multiple-member constituencies and the introduction of two ballot papers for the choice of a candidate and a political party. Whatever the final form of elections the problem of adequate representation of Tamils outside the North and East cannot be resolved satisfactorily if there is a poor voter turn out in elections.Why is voting decreasing among Tamils in the seven provinces outside the North and East.Why are eligible voters not voting in large numbers? This is the question to be addressed and remedied if the decline of Tamil political representation is to be prevented in the seven “Sinhala” majority provinces. The new born Tamil Progressive Alliance faces a formidable challenge in this respect.